Olga Lemberg, a pediatrician, created Fabled out of a personal need: she couldn't find scrubs that felt connected to her unique personality and style. She launched Fabled out of personal experience of work-related burnout and losing touch with who she was. She started a company that would bring beauty, joy and self-care into the lives of women healthcare professionals by providing thoughtfully designed scrubs produced in California. Follow her on Instagram for a behind the scenes look at her scrubs. Why did you start Fabled? Fabled grew out of a need to solve a problem I had. My background is that I'm a hospital-based pediatrician and my problem was not being able to find modern, functional scrubs that I was proud to wear and didn't sacrifice my personal style. I've always felt a strong connection between the way I present myself sartorially and my confidence level - in part because it feels great to dress aligned with your sense of self. Unfortunately, medical scrubs are notoriously basic, sloppy and devoid of personality - 100% opposite of the people who wear them. 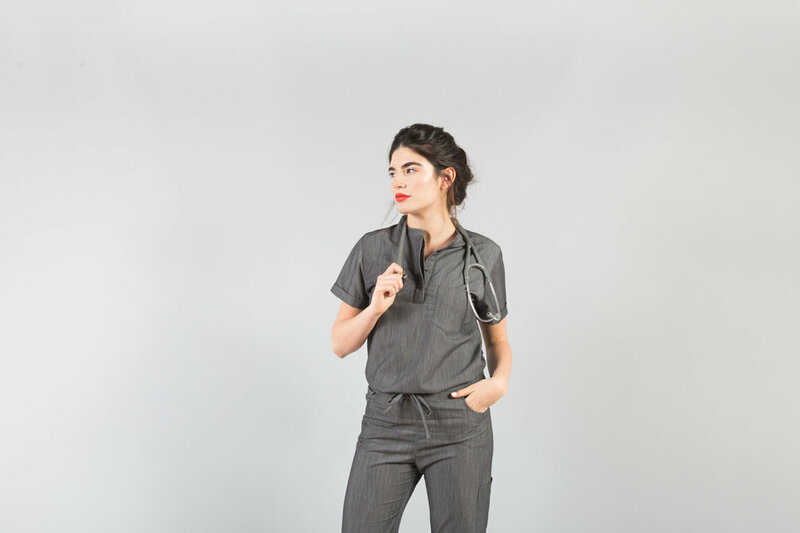 Women healthcare professionals are just like any other professional women - we want workwear that brings us joy and lets us express our unique voices and strengths. I started Fabled to help promote joy, dignity and self-care for women healthcare professionals. The most exciting day as a founder was the very first time I wore one of my early prototypes to work. I was about to start a sixteen hour shift that night at the hospital and I remember when I first walked into my office - an office shared by a group of physicians - both my male and female colleagues immediately started complimenting me on my scrubs and asked me where I got them. It was super fun to say, "I designed them myself!" I was stopped in the hallway and given compliments by various staff members all night. This very early market validation felt great and it definitely gave me a confidence boost to keep going! What is the inspiration behind 'In the Wild,' Fabled's blog? The medical education and work culture can be really intense and sometimes even stifling - expectations for excellency and dedication are incredibly high. To succeed in this profession and achieve what's expected of them, medical professionals have to sacrifice a lot, including often times forgoing interests and passions that are deeply part of their identity - the very things that allow them to recharge and stay resilient. Like creative or athletic goals, for example. More than just the sacrifice of time and debt, it almost feels like there’s this unspoken belief that non-medical interests can only detract from your skill set (when in fact they probably add to it). And this starts to take a toll on many of us, physically and emotionally. The blog is all about highlighting and celebrating the diversity of backgrounds and passions that are amongst the healthcare professional community. I want to expose and normalize the fact that healthcare providers are multi-dimensional people who lead dynamic lives beyond their medical profession. My hope is that the In the Wild blog might effect positive change on this aspect of our work culture. Decision fatigue. There are so many decisions - big and little - you have to make for your business along the way. Particularly as a solo founder. And when everything is so new to you as a first-time founder, confidence in many of those decisions can be hard to come by. So you end up thinking and re-thinking so much of what you do, which can take a toll mentally and physically. I've been daydreaming about getting Mindy Kaling to wear my scrubs on her show The Mindy Project! Did your background as a pediatrician inform your creative process behind Fabled? Training to be a physician was not unlike being a first time founder, especially for someone like me who had no background in anything business related. Just like when I was a medical student, becoming a founder meant that I had to learn an entirely new language and set of skills in record time, and in both situations the stakes were high. There were a lot of sleepless nights, staying up late studying and researching and getting comfortable with the uncertainty of the road to success. In both cases it was crucial to believe in myself no matter what and to pour all my passion and dedication into what I was doing on a daily basis. There’s a level of perfectionism that lends itself well to both endeavors, though too much can break you too, in either scenario. My medical training was by far the most difficult thing I've ever done and I knew that if I could survive that, I could survive almost anything. And at the end of the day being a physician has given me perspective throughout the process of founding my company - a perspective on what truly matters in life, like family/friends, self-actualization, health and joy. @mamacaxx! It's run by Mama Cax, a fearless and stunning Haitian-American blogger, model and disability advocate. She's also a cancer survivor. I can't say I've had this particular experience recently but I do listen to a ton of business podcasts. Some of my favorites are The Venture, How I Built This, American Fashion Podcast, Loose Threads, Shopify Masters, TGIM, Open for Business, StartUp Podcast and The Accidental Creative.